More shows and new directions for 2018? "Behind Bars: Democracy" was selected to be featured in the upcoming winter holiday show from October 22 - December 21, 2017 at the Belmont Gallery of Art, 19 Moore Street in Belmont, MA. Opening Reception is November 3, 2017 from 6:30pm-8:30pm. Meanwhile, new directions at the horizon for 2018. Thinking about a possible interlude from collages with a return to pencils and charcoal. Also very much interested in the fluidity and stark quality of ink as a medium. Exciting prospects! The Making of "Butterfly Kisses"... the video. I enjoy capturing the process and many steps along the way before getting to the final picture. Here are a few moments captured during the making of "Butterfly Kisses". "M" is the story of a secret. This piece aims to capture the oppressive nature of raw and merciless passion, how it mangles our reality into a surreal and rosy-like fantasy with complete disregard for reason or objectivity. "M" encapsulates the helpless feeling of being at someone's mercy, tossed between ecstasy and horror. "M" is the story of two characters thrown against each other by fate like powerless peons. Gray Studies #4 (he is back)... I got a quick brain telegraph to stop all projects underway and slip this one in. And so I did... fourth one in... where is this project actually going, nobody knows.... this project feels like chiseling an iceberg with a toothpick. 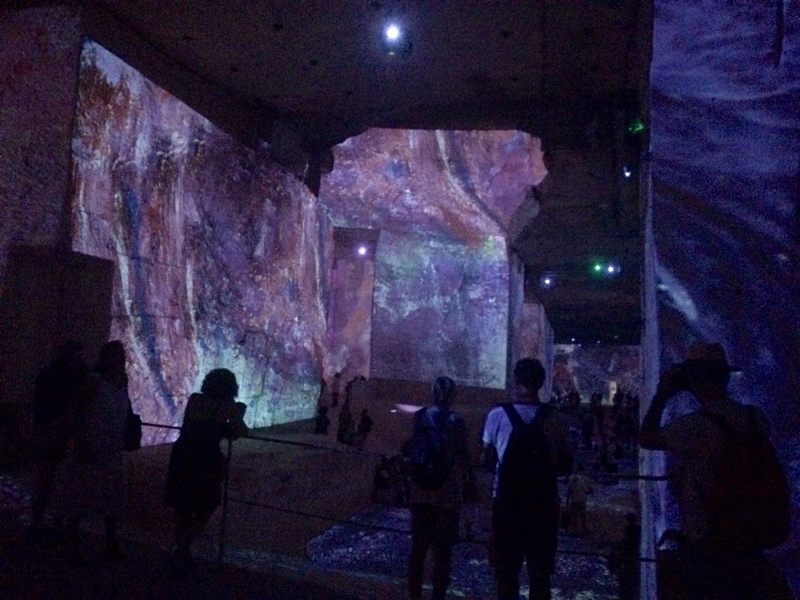 If you are not able to sample for yourself this incredible trip within Painter Marc Chagall’s extraordinary world, here are a few pictures of the ongoing 3-dimmensional “Carrieres de Lumieres” Music and Light show held in the most unusual and spectacular setting, the Baux-de-Provence old stone quarry. Picture yourself (if you can) immersed in 13 thousand square feet of 3-dimensional art projection. The natural setting is overwhelming, pitch dark at times and cool (55 degrees Fahrenheit) with walls 45 feet high and uneven floors roughly carved in stone. It is a fireworks of giant rojections moving to a perfectly coordinated music selection. Did I mention there are 13 thousand square feet of art (4000 square meters) projected by over 100 video cameras? For a virtual visit, here are a few pictures and also is a fantastic, short video I found on Youtube well worth checking out. Jusqu'en janvier 2017 - Splendide spectacle sur les œuvres de Marc Chagall, maestro de la couleur. Un spectacle son et lumière dans les majestueuses Carrières de Lumière, qui nous plonge au coeur de son oeuvre, inondé par les couleurs et la musique enveloppante, des plus grands airs d'Opéra aux musiques de Uri Caine. I put this number away 90% completed last winter in frustration. It just wasn't talking to me and I had no idea what to do with it. Just pulled it back out 2 days ago in between projects and this time, it was ready to communicate! Timing is everything. Gray Study #3 is all about David Gray's creative and songwriting process as can be perceived or imagined from the outside. However preposterous a goal, it makes for a very exciting assignment and a tremendously intriguing theme to explore and to try to render visually. How are his songs created? Which paths does he wander down to always discover new, lovely and unique places? More generally speaking, how does one chase after the slippery shadow of an artistic concept, patiently carving, chiseling and smoothing one's way towards that ultimate vision?